Twenty five years ago, it was rare to have a patient walk into a plastic surgeon’s office after substantial weight loss. But these days, we routinely see patients at Orange County Plastic Surgery who have lost in excess of one hundred pounds. About three quarters of the massive weight loss patients we see did so with the assistance of bariatric surgery – such procedures have been designed to either decrease the size of the stomach pouch or some variety of “bypass” which shunts food down the intestines quicker without absorbing as many calories. Since you fall into the post massive weight loss category, you are first to be congratulated for losing so much weight! You have done your general health a massive favor! Unfortunately, most skin does not go back to its pre-stretched condition. The part that is most obvious to most patients is the skin excess in the abdominal area, but removing this alone rarely gives a patient a satisfying result as they will next focus on the loose skin of the back, thighs, breasts, arms or face. To get a total correction, one that requires two or more procedures, most post weight loss patients desire to have the excess remaining skin from backs, thighs and arms removed, their breasts uplifted, with or without an implant, or reduced, and lax facial skin tightened. You are not alone in this struggle to loose weight. There is an obesity epidemic in the United States. 11-15 million Americans are morbidly obese, a 200% increase in the last 20 years. According to a report from the Centers for Disease Control and Prevention, obesity became the leading cause of mortality in the United States in 2005, with a death toll of 500,000 per year, surpassing the death toll from tobacco use. As a result, the popularity of bariatric weight reduction operations like gastric sleeve, gastric banding and gastric bypass surgery is soaring (approximately 200,000 cases per year). The health benefits to such patients are measurable but many are horrified by the amount of loose skin they see over their legs and thighs, abdominal and back, breast, arm and facial areas. Such patients frequently end up at Orange County Plastic Surgery to seek the expertise of Dr. Bunkis and his staff. I could not begin to tell you what your best option would be without evaluating you in person. Please call us at (949) 888-9700 and ask the staff to arrange a complimentary consultation for you and I will be happy to give you my best opinion as to your options. But to leave off, here is a before weight loss patient and a final follow up photo after I did her reconstruction in multiple stages. 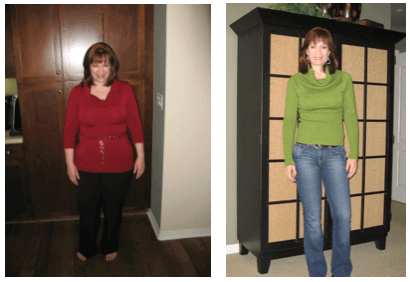 (Actual patient of Dr. Bunkis) Before weight loss through a diet and exercise program and after reconstruction by Dr. Bunkis. Patient’s maximum weight was 260 but she did not have any photos at that weight (“I was camera shy”). The photo on the left is patient at 235 pounds, on the right currently at 130 pounds!